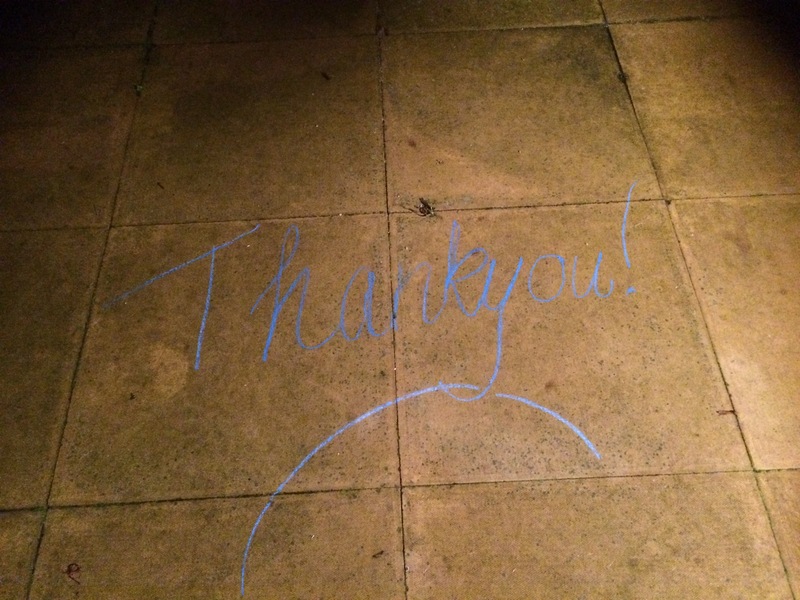 A month ago, the day I bought the ticket that would take me to see my friends before they emigrated to Australia I wrote this on the patio for my partner. It was to express my Thanks for such a lovely gesture. A month later, the word has faded out there, in all the changes of the weather that has hit it but my gratitude has not. We have been together a long time now. Yet I am so thankful to him for the things that he has given me within the past month alone. The experiences which we have spoken of over the years and in recent months which he has pushed me into and I have enjoyed wholeheartedly but which I would not have thought of doing without his gentle shove. He motivates me you see, but in a gentle, supportive way, which makes me feel capable of the changes that are happening, in readiness for their arrival. We have found the last year tough on many ways and so I would not do something extravagant as I concentrated on just paying the bills. But he felt that I deserved a break from it all, well a couple of them in fact. The best of all, he is there when I arrive home and so is our boy ready to welcome me and hear my news and for the first time in ages, I have some for I have been somewhere and done something and I am grateful, so grateful.